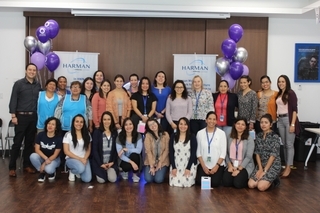 SHANGHAI, CHINA – HARMAN International Industries, Incorporated (NYSE: HAR), the premier connected technologies company for automotive, consumer and enterprise markets, today commenced operations of the HARMAN Suzhou Global Product Development Center (PDC). The new facility, located in the Suzhou Industrial Park, is HARMAN’s largest comprehensive R&D hub for car audio products worldwide, and the third global car audio product development center following the United States and Germany. 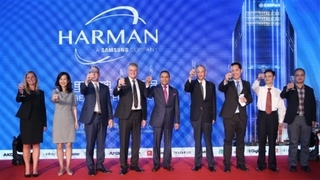 The Suzhou PDC will work side-by-side with HARMAN’s existing manufacturing facility on the same site for seamless integration of development and production, making HARMAN the only supplier in China's automotive branded audio industry to boast full value chain capabilities including sourcing, R&D, production, technical support and distribution and retailing. Covering 12,000 square meters, the Suzhou PDC can accommodate 350 scientists, engineers and supporting teams, and features advanced R&D facilities. The facility boasts world-class product development labs, testing labs and pilot manufacturing lines. It will be responsible for providing product testing services to HARMAN plants globally supporting tests for acoustic environment, EMC, machinery, acoustic inspection, and stability and consistency. The Suzhou PDC and other regional product development centers will work seamlessly to cross share best product design knowledge and new audio technology implementation methodology to enable trans-regional cooperation with local and global partners as it leverages HARMAN's global research network. The Suzhou PDC will work closely with fast-growing automakers in China, such as BAIC Motors, BYD, Changan, Chery, Geely, Great Wall, SAIC-GM, and build HARMAN as a one-stop premium audio solution supplier serving the China market, as well as offer technical support and state-of-the-art solutions to leading auto brands worldwide. Established in 2006, the Suzhou production facility is HARMAN’s largest R&D and production base in the Far East and Asia Pacific. With its strong confidence in the China market, HARMAN has continued to invest in China and locate its global car audio product development center in Suzhou to further sharpen its competitiveness in this dynamic market. In the 2015 fiscal year, HARMAN recorded approximately US$680 million in China-related revenues, with an annualized growth rate of approximately 53% over the last six years. HARMAN (harman.com) designs and engineers connected products and solutions for automakers, consumers and enterprises worldwide, including connected car systems, audio and visual products, enterprise automation solutions and connected services. With leading brands including AKG®, Harman Kardon®, Infinity®, JBL®, Lexicon®, Mark Levinson® and Revel®, HARMAN is admired by audiophiles, musicians and the entertainment venues where they perform around the world. More than 25 million automobiles on the road today are equipped with HARMAN audio and connected car systems. The Company's software services power billions of mobile devices and systems that are connected, integrated and secure across all platforms, from work and home to car and mobile. HARMAN has a workforce of approximately 28,000 people across the Americas, Europe, and Asia and reported sales of $6.5 billion during the 12 months ended December 31, 2015. The Company’s shares are traded on the New York Stock Exchange under the symbol NYSE: HAR.